Suppose that we discovered new preventive treatment that cut the risk of appendicitis by half. The new treatment, Append-end, if added to the water supply, would result in 125,000 fewer appendectomies per year, saving millions of dollars in medical costs and lost productivity and wages. And suppose that extensive pre-market testing revealed that Append-end had only one side effect. Approximately 1/100,000 people who ingest Append-end will experience a cardiac arrest within a week of taking it. In other words, if we put Append-end in the water supply of 300 million Americans, 3000 will die from cardiac arrest long before they reach the hospital and therefore, long before they can spend healthcare dollars. Should we put Append-end into the water supply? Think of the more than 100,000 people a year who will be spared pain and suffering. Think of the decrease in hospital utilization. Think of the tens of millions of healthcare dollars saved. Balance that against the side effect of a mere 3000 deaths. No, of course we shouldn’t and hopefully wouldn’t put Append-end into the water supply. We cannot let 3000 people die in exchange for the relatively trivial benefit of substantially reducing appendectomies. We should never contemplate sacrificing 3000 otherwise healthy individuals just to save money. Now let’s consider an example a little closer to home. Suppose we found a treatment to reduce the level of medical unindicated iatrogenic late prematurity (37-38 weeks gestation) and the associated respiratory difficulties, NICU admissions, and hospital costs. Medically unindicated iatrogenic late prematurity occurs when elective inductions or C-sections are scheduled before 39 weeks gestation. Accurate figures are hard to obtain, but let us suppose that about 200,000 newborns per year are iatrogenically premature, and that leads to about 20,000 NICU admissions per for medical problems like mild respiratory distress. Let’s suppose our treatment could prevent all 200,000 cases of iatrogenic late prematurity. We could spare 20,000 newborns and their families the discomfort and distress of a NICU admission, and we could save tens of millions of dollars in the process. But there is one side effect. 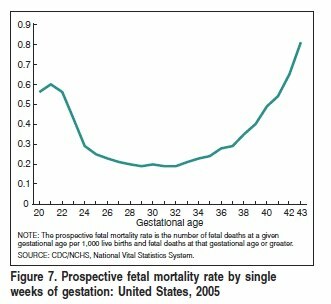 As the chart below illustrates, approximately 3/10,000 babies will die in utero each week between 37-39 weeks. If those 200,000 iatrogenic late premature births are prevented, 60 apparently health babies will be stillborn each week for a total of 120 babies. Should apply the treatment? Think of the more than 20,000 newborns a year who will be spared pain and distress of a NICU admission. Think of the decrease in hospital utilization. Think of the tens of millions of healthcare dollars saved. Balance that against the side effect of a mere 120 newborn deaths. Is 120 newborn deaths an appropriate price to pay to eliminate 20,000 NICU admissions? I don’t think so. As it happens, we are already applying the treatment, led by the March of Dimes. Ever since polio was effectively eliminated by routine immunization, the March of Dimes has been struggling for relevance. In the past decade, it has latched on the issue of prematurity, an important issue by any stretch of the imagination. Unfortunately, no one knows how to prevent most cases of prematurity, so the March of Dimes has begun to focus on iatrogenic prematurity, prematurity caused by medical interventions. They have created a campaign entitled Healthy Babies are Worth the Wait. Hospitals, HMO’s and insurance companies have rushed to implement it. For the life of me, I cannot figure out what the March of Dimes is thinking. It is irrefutable that if you prevent those 200,000 incidents of iatrogenic prematurity, 120 babies WILL die. There is no way around that. There have been no advances in stillbirth prevention so there is no way to prevent those deaths. What the March of Dimes fails to understand, and apparently has never even considered, is that the increased morbidity of late prematurity has been EXCHANGED for the decrease in perinatal mortality. There is literally NO WAY to decrease morbidity without increasing mortality. It is literally IMPOSSIBLE to reduce NICU admissions for iatrogenic prematurity without sacrificing the lives of 120 babies. This is a straightforward result of what we already know about stillbirth. Recent research has only served to confirm this. Neonatal Outcomes After Implementation of Guidelines Limiting Elective Delivery Before 39 Weeks of Gestation by Ehrenthal et al published in the November issue of the journal Obstetrics and Gynecology looked at neonatal outcomes before and after limiting elective delivery prior to 39 weeks of gestation and found that reduction in early elective delivery reduced NICU admissions, but the stillbirth rate increased from 2.5 to 9.1 per 10,000 term pregnancies. I have been struggling to understand what the March of Dimes is thinking. The decrease in morbidity from preventing iatrogenic premature is achieved at the INEVITABLE expense of a substantial increase in perinatal mortality. It would be one thing if the March of Dimes actually considered and made public this inevitable increase in perinatal mortality, and acknowledge that they believe it is worth it to let 120 babies die in order to prevent 20,000 NICU admissions. At least that would allow the rest of us to participate in the decision making process. But by failing to make clear (either through ignorance or by deception) that the only way to decrease iatrogenic prematurity among newborns is to let some babies die, they have pre-empted the conversation that we need to have. Preventing iatrogenic prematurity by ensuring that a subset of the sufferers die instead can’t possibly be the right way to address this issue.